Miracles Do Happen and True Love Can Come True. Here’s my theory behind the creation of Disney’s direct-to-video (DTV) sequel, The Hunchback of Notre Dame II. Some Disney executive spent the six years between films unhappy because of the way the 1996 original concluded. “Why can’t Quasimodo get the girl?” And now we have II, a flick that seems to exist solely to right that potential wrong. II takes place a few years after the conclusion of Hunchback. Quasi (still voiced by Tom Hulce) seems like a happier dude now that Frollo no longer controls his life and he hangs out with friends Phoebus (Kevin Kline) and Esmerelda (Demi Moore). He also gets to play with their young son Zephyr (Haley Joel Osment). Things seem pleasant and cheerful except… the Festival of Love rapidly approaches, and it seems like everyone in Paris has a significant other except for hideous old Quasi. He fears love will never find him, but then the circus comes to town and he becomes enchanted with cute young magician’s assistant Madellaine (Jennifer Love Hewitt). She also seems to take an interest in him, although an ulterior motive comes into play. She works for dastardly Sarousch (Michael McKean), a thief who uses the circus as a front for his criminal ways. He sets his sights on Notre Dame’s magnificent bell called La Fidele and forces Madellaine to feign interest in Quasi to distract him. Reluctantly she agrees, but inevitably she develops true feelings for the misshapen mook. Though forced to betray him, she tries to correct her mistake and ensure that all ends happily ever after, and Quasi finally gets the girl! As I see more and more of Disney’s DTV sequels, I grow less and less entertained by them. 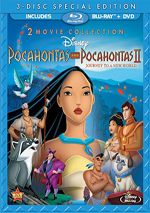 Admittedly, efforts like The Lion King II: Simba’s Pride and and Pocahontas II: Journey to a New World didn’t exactly bowl me over, but I found them more entertaining than recent works like Cinderella II: Dreams Come True and Hunchback II. The latter probably suffered because I watched it immediately after I screened the original. Would I have liked II under any circumstances? Probably not, but the stark contrast of the very good first flick and the mediocre-at-best sequel made II appear even more problematic. If forced to pick a positive related to Hunchback II, it’d relate to the casting. I felt very surprised to hear so many original voices. I knew Hulce would come back, but wasn’t aware that some of the others would be present. 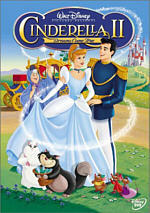 Disney promoted II for many months prior to its eventual release; I think the ads started to pop up on other DVDs at least a year ahead of time. I reinspected one of these and noticed it did mention Kline and Moore, but I forgot that. It was a pleasant bonus to hear them again. The only even remotely significant absentee is David Ogden Stiers’ archdeacon, but since that was a very small role in the first movie, he isn’t missed here. Of course, Tony Jay’s Frollo doesn’t come back since the character died at the end of Hunchback, and Mary Wickes can’t return as gargoyle Laverne, since she passed before the original film finished. Jane Withers completed the remaining work and she performs the role in II. Charles Kimbrough and Jason Alexander return to play the other two gargoyles, Victor and Hugo. In addition, two other semi-notables join the fray in the forms of Osment and McKean. The latter clearly gets the better part, as the vain and conniving Sarousch gives McKean a chance to ham. Osment’s Zephyr is a dull little guy, though, and the actor can’t do much with the vapid role. Wow - I just realized the cast includes no fewer than three Oscar nominees! Osment got a Best Supporting Actor nod for The Sixth Sense, while Kline actually won that prize for A Fish Called Wanda. Hulce was nominated for the title role in Amadeus, an award he lost to castmate F. Murray Abraham. There’s a lot of talent here, all of which seems wasted on a bland and joyless project. Admittedly, a few mildly amusing moments emerge, but most of II feels like a product, not a movie. The plot is negligible at best, as it mostly just rehashes elements of the first film. This is most obvious during the early scenes, and Sarousch exists as nothing more than a less sinister version of Frollo. Combined with the flat story, we find some genuinely bad art and animation. The latter rarely rises above the level seen on Saturday morning shows; characters move stiffly and without any fluidity or natural tones. Such problems plague many Disney DTV flicks, but at least most of those show reasonably solid art. Not the case for II, which seems to have been drawn with extremely thick lines that never remotely approach the clarity and nuance of the original movie's images. Possibly even more glaring are the basic colors of II. Hunchback offered a veritable feast of hues; they looked wonderfully rich and subtle. Not so for the sequel, which looks exceedingly simplistic. To make matters worse, the filmmakers can’t even keep the colors straight! During a few scenes, Hugo takes on an odd salmon tint instead of his natural gray. Frankly, the movie’s hues are a mess. Add to that some of the crummiest songs yet heard in a Disney flick - I still can’t get over how weak “Fa La La La Fallen In Love” is - and you have a genuinely bad piece of work. I want to like Disney’s DTV offerings, and I always hope one will emerge from the pack and actually provide a positive experience. Unfortunately, with The Hunchback of Notre Dame II, matters just continue to slide. It’s not the worst of the bunch - the presence of all those talented actors makes that impossible - but it’s a poorly made and moderately unlikable flick. 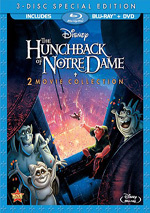 The Hunchback of Notre Dame II appears in an aspect ratio of approximately 1.66:1 on this Blu-ray Disc. The many problems that occurred due to the cheap animation meant that the movie never presented a very vivid impression. Sharpness was inconsistent. Some shots delivered terrific accuracy and clarity, but others seemed fuzzy and bland. Some light shimmering occurred, and I saw a few slight instances of jagged edges. Haloes weren’t an issue, and I noticed no noise reduction of print flaws. Colors often seemed heavy. At times the hues felt dynamic and full, but they also could become muddy and thick. Black levels seemed acceptably deep and rich, while shadow detail looked appropriately dense without too much darkness. Though I doubt Disney put too much effort into this transfer, I suspect the source material deserved the blame for the concerns. The film offered cheap production values that left us with drab animation/art. While a better transfer probably could’ve brought out a bit more clarity and detail, I doubt we would’ve seen much of a difference; this was silk purse/sow’s ear territory. The DTS-HD MA 5.1 soundfield of Hunchback II mainly stayed with a bias toward the front speakers. Within that spectrum, music displayed good stereo imaging and presence, while effects also offered strong delineation and movement. The front realm gave us a clear and well-blended environment in which elements panned smoothly. Surround usage seemed somewhat limited, though it worked reasonably well for the film. The rear speakers mainly reinforced effects and music. On some occasions, decent split surround material appeared, but those instances happened fairly infrequently. The back channels added dimensionality to the proceedings but not to a huge degree. Dialogue came across as reasonably natural and distinct, and I heard no problems related to edginess or intelligibility. Music appeared clear and bright and the songs showed nice depth. Effects were clean and accurate, as they displayed no distortion. Nothing here dazzled, but the audio was fine for the material. How did the Blu-ray compare to the original DVD from 2002? The audio was a little peppier, and visuals showed superior definition and colors. The restrictions of the source material held back the presentation, but it still marked growth over the DVD. The Blu-ray provides most of the DVD’s extras. Behind the Scenes With Jennifer Love Hewitt offers a very glossy four-minute and 51-second featurette. Hosted by some kids from the Disney Channel’s Movie Surfers show, the program offers some brief and uninformative comments from Hewitt and then shows her in the studio as she records one of the movie’s crummy songs. Blech! The other supplements don’t fare any better. Festival of Fun includes two activities. “Bells of Notre Dame” allows you to manipulate different sequences of chimes, while “Puppet Theater” lets you arrange a dance for a silhouette version of Djali the goat. Both seem dull and pointless; kids might like them, but I doubt it. Next we discover A Gargoyle’s Life: It’s Not Easy Being a Gargoyle. This gives us a two-minute and 42-second clip in which Jason Alexander reads a lame poem about the life of a gargoyle. Skip it. The disc launches with ads for The Little Mermaid, Monsters University and Planes. These also pop up under Sneak Peeks along with promos for the Epic Mickey 2 video game, Radio Disney, Mulan, Super Buddies, and Return to Neverland. A second disc offers a DVD Copy of Hunchback II. It duplicates the 2002 release right down to the same previews, so it also tosses in a “Festival of Fun Activity” missing from the Blu-ray. Some of Disney’s direct-to-video sequels entertain, but not this one. The Hunchback of Notre Dame II seems like one of the worst of the bunch, as it provides a dull, insipid and bland piece of work. The Blu-ray provides bland visuals and audio along with almost no bonus features. Nothing here satisfies. Note that the Blu-ray of Hunchback II pairs it with the original 1996 film. Both appear on the same disc.